In first part of this series, we did a high-level comparison between free versions of VMWare ESXi and Microsoft’s Hyper-V. Next we highlighted the difficult challenge that exists when setting up Hyper-V to be a remotely managed, headless server. 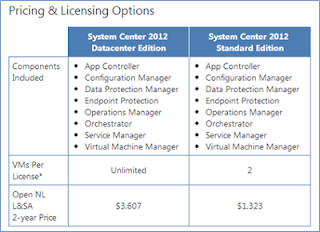 In this part of the series, we will give you the essentials needed to start using Hyper-V and the winner of our comparison. 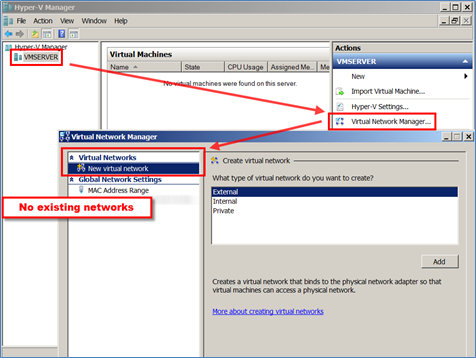 After connecting to your server with Hyper-V Manager, you will notice that you have no Virtual Networks when you select the Virtual Network Manager. 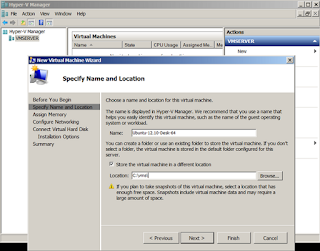 If you want your virtual machines to have Internet access, you need to create a virtual network to provide it. 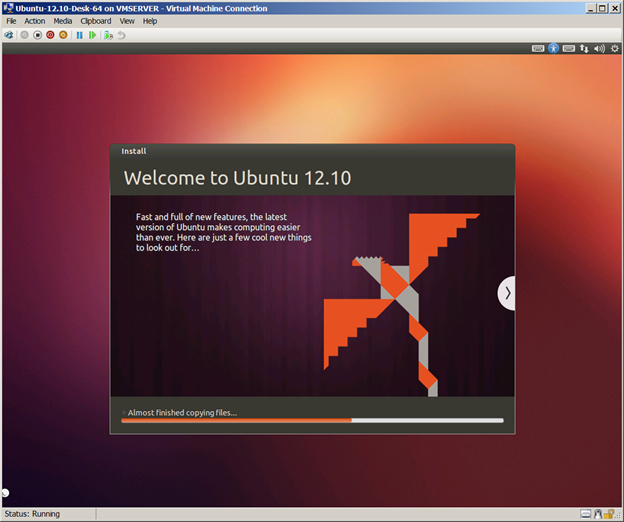 To create a new virtual network, click the hyperlink for “New virtual network”. 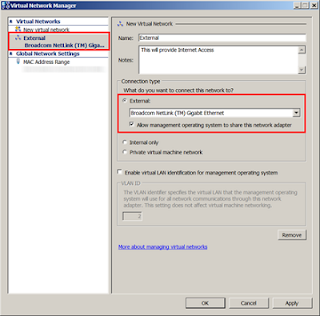 Assign a name, select the Network Interface Card (NIC) to bind it to, and optionally assign a VLAN ID. Now when you are creating your virtual machines, you can assign them a network. 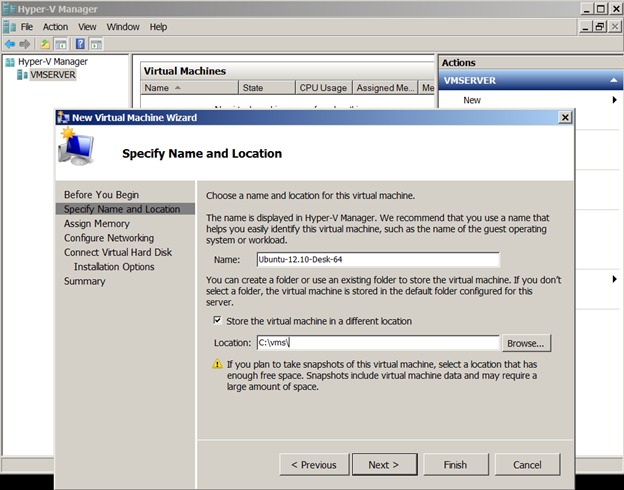 Speaking of creating a VM, this part is pretty easy and very similar to using VMWare vSphere client with ESXi. 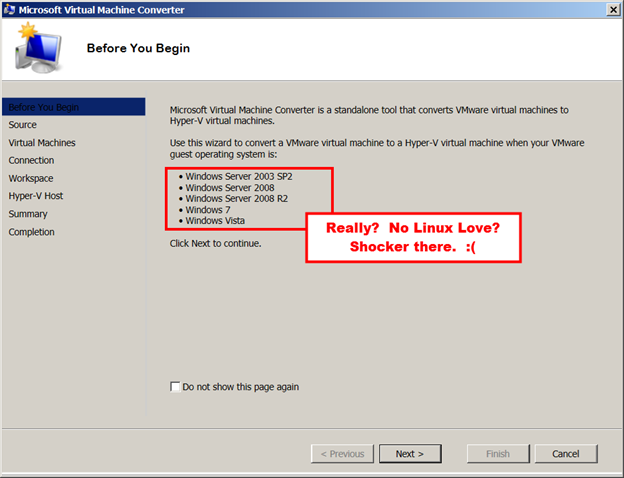 It would be far too easy if VMWare and Hyper-V used the same virtual machine format. We should all pray for quicker adoption of OVF… But, who doesn’t like a challenge? So, what are the differences between the two preferred formats? This may not seem like substantial differences at first, but the hard drive controller is a major concern. So major that if your VMWare VM has a SCSI hard drive, you need to make sure you add an IDE drive of arbitrary size so the IDE drivers are loaded before conversion. Isn’t there an easier way? Fortunately for us, Microsoft has also provided a free tool similar to the free stand-alone VMWare converter tool. 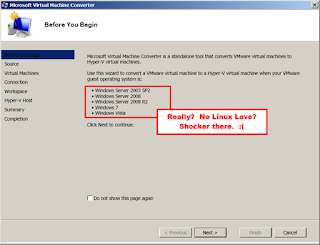 Microsoft calls theirs: Microsoft Virtual Machine Converter (MVMC). 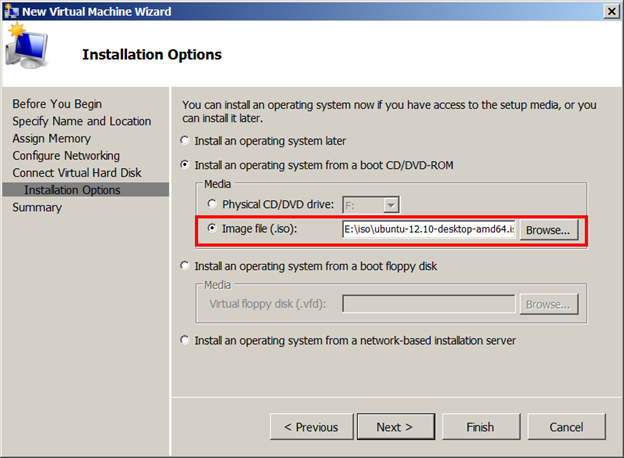 Note that the command line interface of this tool can convert a hard disk, but not a virtual machine. 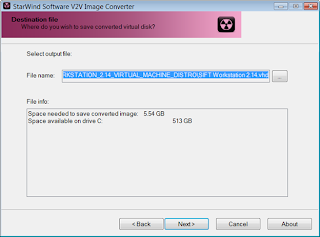 Meaning if you wanted to convert a .vmdk to a VHD in order to mount the drive in Windows (because Windows 7+ can mount VHDs) that is an option with this tool. 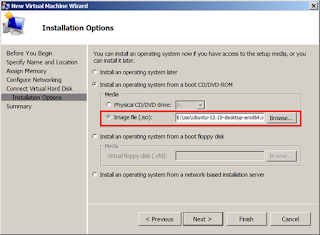 But you will not be able to automagically convert the disk and then boot it in Hyper-V as an OS. Looks like we have to do a manual conversion now--Ugh!!! 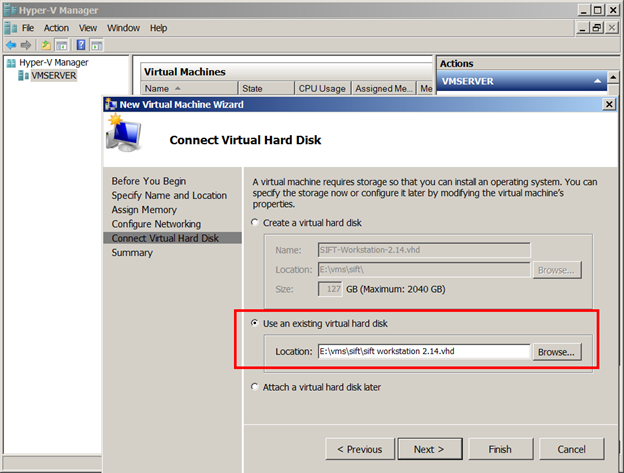 The first thing we should know about VMWare virtual disks is that they end with .vmdk. However, sometimes there are many .vmdk files. If you are downloading a virtual appliance that has multiple disks or a snapshot already taken or both, you will end up with a few files. SIFT Workstation is such an appliance. You will notice in the screenshot below that there are 4 vmdk files. The ones without the 6 #’s are the raw hard disks. The ones with the 6 #’s are for snapshots. 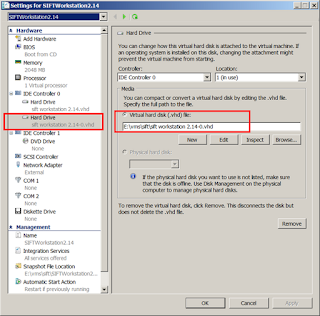 We will attempt to convert the raw hard disks and start those in Hyper-V.
SteenKirkby wrote a great detailed blog post, but most of the information was no longer current. 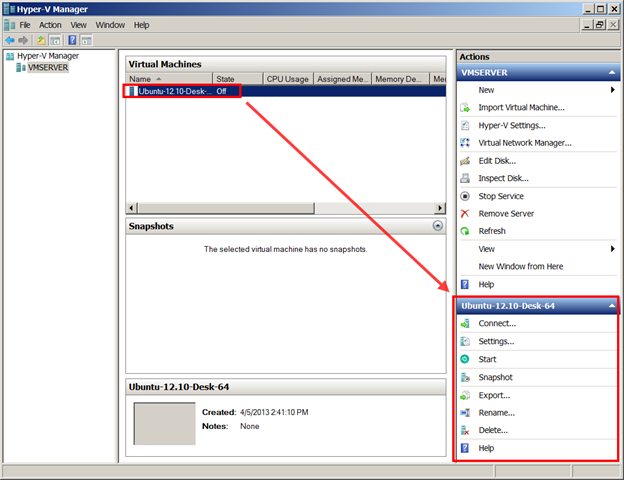 The vmdk2vhd (vmtoolkit.com) no longer exists on any reputable sites that I could find, but at least the steps were sound so I used that method with another tool. Does anyone else find the “TODO: add description” a little worrisome? :) Eh, let’s give it a go anyway! 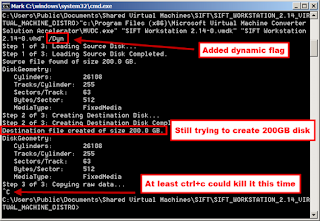 "c:\Program Files (x86)\Microsoft Virtual Machine Converter Solution Accelerator\MVDC.exe" "SIFT Workstation 2.14-0.vmdk" "SIFT Workstation 2.14-0.vhd"
When we were trying to convert the SIFT Workstation, the VMWare appliance /dev/sdb disk was dynamically allocated consuming only 59MB of actual hard drive space. MVDC.exe does not convert disks dynamically without the use of the /Dyn flag, thus it proceeded to expand the disk to its full (static) size of 200GB! The worst part is that nothing can stop MVDC once it has started the conversion without the /Dyn option. Control+c had no effect. Task manager could not kill MVDC.exe or the cmd.exe window. tasklist /f /im MVDC.exe was ineffective as well. A reboot was required to stop the madness. 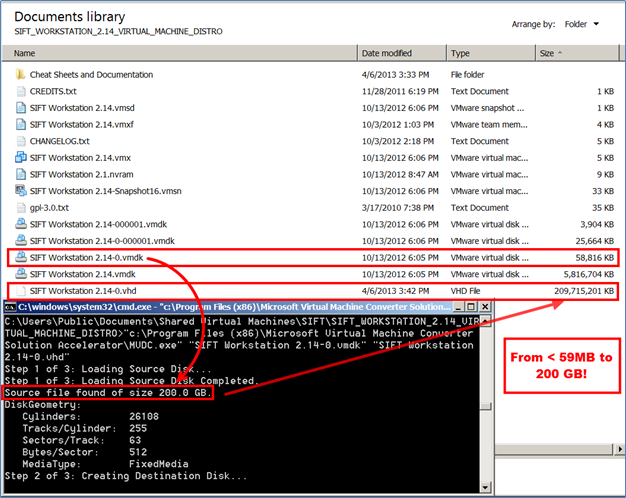 Even with the dynamic flag as shown below, the program still tried to create a 200GB disk. The difference was with the /Dyn flag, the operation could be killed with ctrl+c and MVDC was slowly creating the 200GB disk instead of allocating the 200GB up front and then populating the data. Ok, since the MVDC /Dyn flag seems to also create a static disk, we need another option. 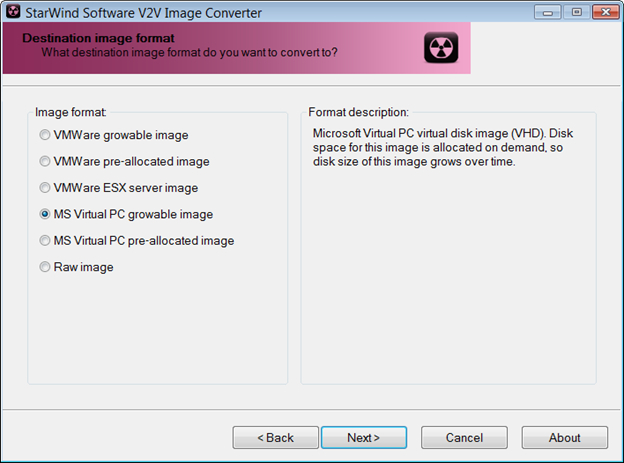 Next Select destination format (if you pick pre-allocated it will allocate the entire disk--used or not), for example mine was a "MS Virtual PC Growable Image"
If you convert both the base and the snapshot files, they will result in the same size VHD, however, they are not the same file as they do not hash to the same value and both will not work. 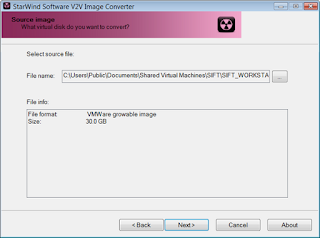 Converting the snapshot files to VHD will not boot. 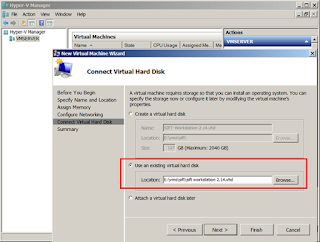 When finished converting, copy the base image VHD files to the Hyper-V server via SMB or USB. Finally after converting the first virtual disk and adding that to a new Hyper-V VM, we are able to boot the SIFT workstation. Unfortunately, we only have /dev/sda right now and will have to convert the second disk /dev/sdb and add that as a secondary hard drive. Looking at these numbers, it appears that the VMWare vmdk’s are 30% and 12% the size of the Hyper-V images for /dev/sda and /dev/sdb respectively. As a side note, Microsoft does have an OVA import tool, but it only links in with their paid System Center application. 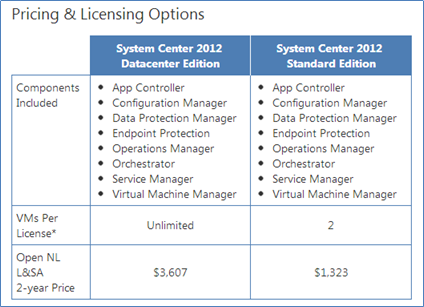 Obviously Microsoft is looking to take away virtualization market share from VMWare and VMWare is trying to maintain that market share and ideally expand their footprint. The problem is, neither solution is perfect (or anywhere near it). Thus there is no clear winner as both companies and products have substantial limitations for the free at-home hacker. There are plenty of lessons learned if these companies would like to woo the nerds of the world which will ultimately help influence corporate purchasing. Clean up the remote management process - Very nice of John Howard to create the hvremote.wsf script, however it should not be necessary. Kudos to John though. Better promote adoption with the nerds - more instructional videos - better, more consolidated help and resources - Have official advice instead of relying on blogs and user base to provide support. 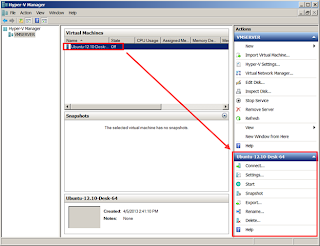 Improve critical items on the Hardware Compatibility List (HCL). Support the most common devices. In the meantime, we would love to hear your feedback. Have you been experiencing similar issues with these products? Do you have any free Type 1 hypervisors that you would recommend? 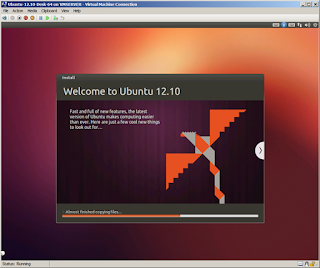 Are you a fan of XenServer, KVM, or something else? Please chime in with your favorites. there are at least 2 other easier ways to do this. 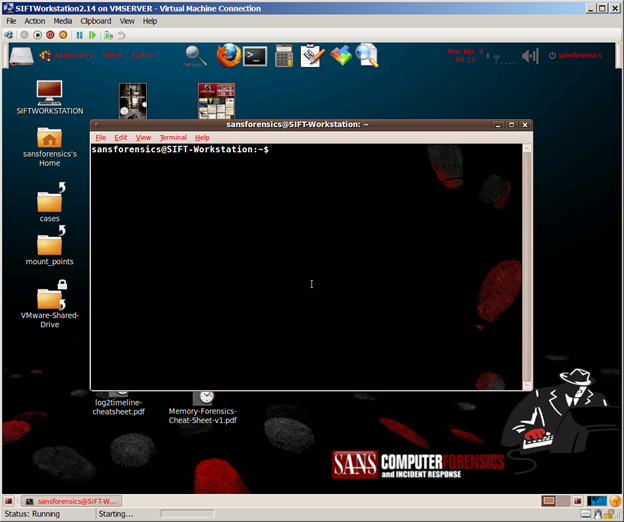 One is with the free software from 5nine v2v http://www.5nine.com/vmware-hyper-v-v2v-conversion-free.aspx or to use disk2vhd from sysinternals. I have blogged about both. 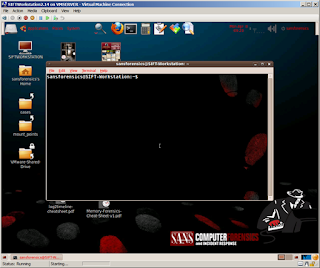 Stephanco.blogspot.com and the 3rd way is to use microsofts vmware to hyper-v conveter I never got it to work properly but some say it works great. I am not one of those people. Incredibly informative. Well done, and thank you!